The paleo movement has given us many things. It has given us a reason to cook & eat bacon on a regular basis. It has revitalized the career of the sweet potato and has popularized the idea of making your coffee bulletproof. Coffee that is impervious to bullets? Tell me more! Bulletproof coffee is a coffee cocktail that claims to burn fat while providing more of an energetic boost with less of the crash associated with regular coffee. What is in this magical drink you ask? 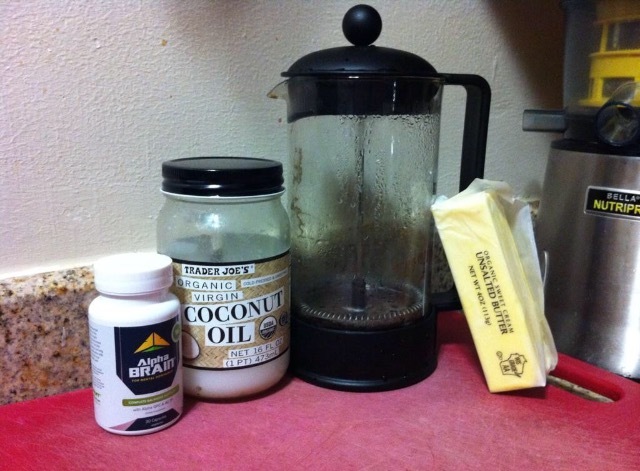 The three main ingredients are: high-quality coffee, grass-fed butter and MCT (medium-chain triglycerides) oil. That’s right. It’s coffee with butter and oil in it. I’m sure all the old school coffee drinkers have just stopped reading this post. The Lean Muscle Project analyzed the claims made by bulletproof coffee promoters and found some truly interesting results. They discovered that bulletproof coffee may provide more of a sustained energy boost than regular coffee. Also, it can help people lose weight by acting as a substitute for a calorie dense breakfast, but it will not miraculously burn fat. I personally have no problem with bulletproof coffee. Heck, I’m drinking a version of it right now! However, I do not use it to help me lose weight, I do not drink it every morning and I use a much smaller amount of butter and oil recommended by the bulletproof believers. The recommended recipe for bulletproof coffee can contain up to 52 grams of saturated fat in one cup which is more saturated fat than a 16 oz T-bone steak (cooked) and 5 whole avocados combined. Hopefully I haven’t discouraged you from drinking bulletproof coffee. If you haven’t drank it yet, give it a try and let me know what you think. Also, if you drink it on a regular bases, I’d love to hear what benefits it provides you. Oh, almost forgot to mention that this product WILL NOT actually stop bullets, in case you were wondering.